She has the easy brain amateurs are looking for but also much appreciated by the professional. Anime P is by the well known Indoctro Preferent out of Pepita S Elite by the GP stallion Emilion Preferent. Born in 2005 she stands almost 17.2 hands. Anime is really special in her own way. She was first bought as a weanling to start my breeding program. She was First Premium and Champion in the KWPN TOP TEN yearling in North America when the jumpers and dressage were inspected together. But soon her disposition, way of going, kindness, beauty , her desire to please capture the heart of my partner and was pulled from my breeding program to become his own riding horse. Her trainer felt in love with her just like everyone who had the chance to be in her contact and repeatedly said on how he would love to have a barn full of Anime. Her breeding career took a side road for many years but eventually since work schedule and other responsibilities made it hard for him to be on a regular riding program I succeed twice to breed her long enough to give me two foals. I have bought since other mares which had the best breeding and mareline in Holland so she was not in my future program anymore and stopped the pressure to breed her. But she was still not ridden regularly, becoming more of a pasture ornament. Now these two foals made me realized how useful she could be in a any breeding program. She give those rare qualities that make you own and keep your horse for life. She is an amateur dream but has the zest and talent to be appreciated by any professional. And this is what trainers of her foals are telling me. So I have permission to try to breed her again once again this year. Capone I was ranked by the FEI among the top 200 showjumpers in the world in both 2006 and 2007 before a battle of ownership kept him almost 5 years out of competition. With his rider Kyle King he placed third in 2011 in their first competition to the $25,000 HITS Grand Prix and then just a week later they won the $25,000 Smartpak Grand Prix . Later on that year they won the $100,000 Oil Patch Grand Prix . With over ten Grand Prix wins under their belt, including the prestigious CN Performance Grand Prix at Spruce Meadows, King and Capone I were quite impressive. Capone was awarded the prestigious “Elite Stallion” award by the BWP in 2012. Capone is a real all around stallion . His rider qualifies Capone as having a strong work ethic, is easy going, kind, smart, and possess a never-give-up attitude. Capone I is light on the forehand, quick with his knees , scopey and stamp his offspring with his athleticism, keenness, wisdom, passion for jumping, and natural talent for dressage. 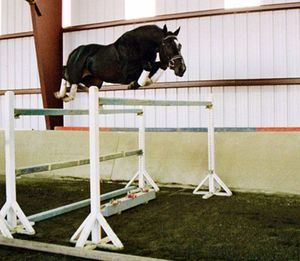 The USEF ranks Capone in 2011 as the 108th best sire of showjumpers . Capone’s success in showjumping verifies the value of his Holsteiner pedigree and specifically his damline, number 890. 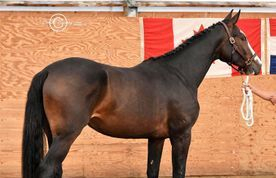 Capone has a full-brother and a half-brother that also are approved stallions in Germany and another half-brother that competed successfully in smaller international Grand Prix classes in Europe. Capone’s second dam, Maltia, is also the second dam of the world-class showjumping stallion Casall la Silla. 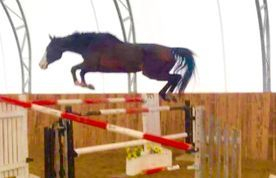 Capone’s damline has produced many other international showjumpers and approved stallions and is precisely the type of damline we look for in a showjumping sire.